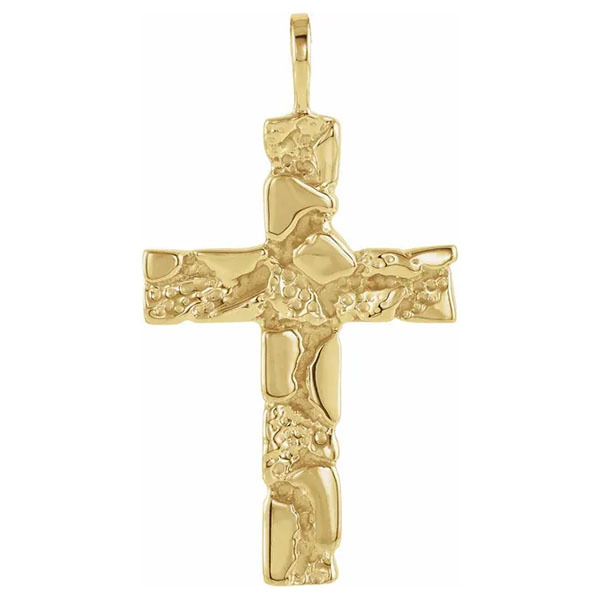 The power and grace of God is uniquely captured in this expertly designed gold nugget cross pendant from Apples of Gold. This dynamic pendant is forged of the highest quality 14K yellow gold, which brings that gorgeous golden glow. The gold cross pendant is given a varied textured look, with nuggets of gold interspersed throughout. This dynamic design is a distinctive and creative work of art. The smooth portions of the cross are polished for the right shine, while the textured surfaces bring their own special quality to the pendant. 27mm x 18mm (1 1/8" x 3/4"). We guarantee our 14K Gold Nugget Cross Pendant to be high quality, authentic jewelry, as described above.